What can we do to help regional food businesses become more competitive? In Cleveland, we start by engaging in collaborative applied research. There has been tremendous growth and interest in local foods in communities across Ohio, and Cleveland has become an epicenter of innovation. Cleveland is now known for its local policies in support of urban agriculture and local purchasing, the high percentage of farmers’ markets in the city that accept SNAP benefits, its dynamic restaurant and culinary scene, and a growing network of hundreds of community gardens and urban farms. With all of this interest and support of local food in Cleveland, community leaders and stakeholders wanted to have a better understanding of the food industry in Cuyahoga County and Northeast Ohio and identify specific ways public and private partners could support new and existing food businesses and job growth. The City of Cleveland and the Cleveland-Cuyahoga County Food Policy Coalition (FPC), a collaborative initiative coordinated by Extension professionals in Cuyahoga County, decided to look at its food businesses as an industry cluster. According to the Brookings Institution, an industry cluster is ‘a geographic concentration of interconnected businesses, suppliers, service providers and associated institutions.’ Local economic development organizations in Northeast Ohio, including The Fund for Our Economic Future and NorTech, have been focusing their work on industry clusters in AgBio, Advanced Energy, Flexible Electronics and Water Technology. FPC and the City of Cleveland partnered with a local consulting firm and used a combination of financial analysis and guidance from regional experts and industry leaders to identify what the region’s food businesses need to be more competitive. A broad group of stakeholders from the economic development community participated in the process including financial institutions, food service companies, grocery stores, farmers, food entrepreneurs, regulatory agencies, local foundations and food manufacturers. These working groups identified the regional food assets and developed a series of interventions to support the growth of food and beverage companies by replacing imported products with local food and beverage sources, expanding markets for exported products outside the region and improving operational costs and the region’s attractiveness to new businesses through sustainability initiatives. 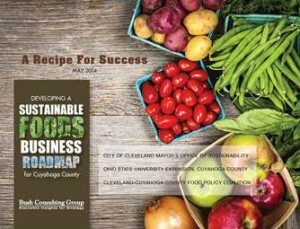 More details are available in a new report, A Recipe for Success: Developing a Sustainable Foods Business Roadmap for Cuyahoga County which outlines the process, findings, and strategic interventions. This report is now available on the Cleveland-Cuyahoga County Food Policy Coalition website both as an executive summary and a full report. Posted in Local Foods, Sustainable Communities	Tagged Food Security, Food Systems, Local Foods	Bookmark the permalink. ← Demonstrate solar energy technology at your next event!